Grass Tech II Static Grass Applicator otherwise known as "The Flock-It Rocket"!!! Professionally designed and manufactured in the USA! Safe, powerful, durable, affordable, lightweight and easy & fun to use! Complete with Screens, Concentration Nozzle and AC Power Adapter! 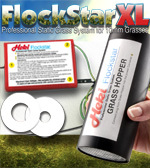 Flockstar XL Professional Static Grass System Includes: One 24-volt Power Converter, one grass hopper with metal screen, Two precision application disks, a 30" power and 30" ground wires and a sample (1.7oz.) of 10mm static grass for more control in flocking small areas. 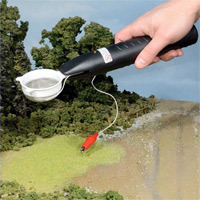 The GrassTech "Mini-Flocker" Applicator is a very high quality instrument designed to provide years of trouble free service for both hobbyists and professionals alike. Ideal for 2mm & 4mm static grasses. Stanley SURFORM Rasp - The PERFECT tool for shaping and sculpting foam 'blueboard'. Fits comfortably in the palm to allow precise control over the most intricate terrain. Excellent for gradual contouring of roadbed and subtle grades. 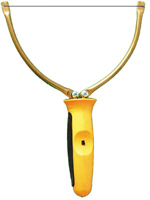 Hard-Wire Bending Pliers - Precision tool for bending sharp creased angles on hard U-Bend B-Wire. The starter kit features the SCULPTING TOOL...the most useful tool in the arsenal. This tool allows you to shape and contour gentle, sloping mountain terrains. The thin chrome wire produces clean sharp cuts quickly with minimal smoke. Set includes the SCULPTING TOOL, 5 Feet of Chrome Wire, Universal Power Station, an Instructional Video and the sturdy carrying case. Hand Sculpting Tool with Wire - Now making hills and mountains has never been easier! 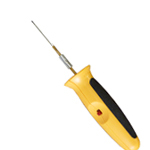 This popular and versatile tool is designed for freehand sculpting, carving and scroll cutting. The arms pivot so the wire can be taut or looped outward. REQUIRES UNIVERSAL POWER STATION! - ALL PRO MODEL KITS SOLD SEPERATELY. PRO-SCULPTING TOOL REPLACEMENT WIRES/6 Pkg. Six (6) replacement cutting wires for the Sculpting Tool with Pro Power Station. Six (6) replacement ribbon blades for use with the Freehand Router and/or 3D Scroll Table. Eight (8) shapeable blades for Freehand and/or 3D Scroll Table Routers.